Bright Holiday Insta Party is perfect to make your holiday party bar shine. Whatever you are celebrating, you and friends can cheers in style with this all-in-one party bar set! 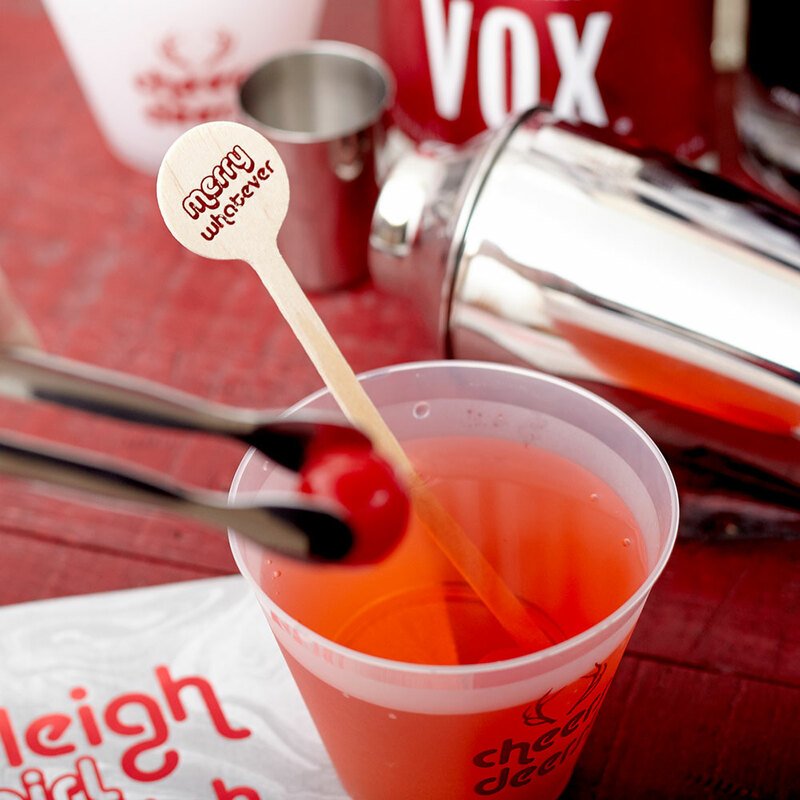 These bar supply sets also make adorable holiday gifts for friends, family and even coworkers. Order your Bright Holiday Insta Party today to gift in style or effortlessly throw a holiday cocktail party. Styled to perfection and totally social media worthy, you and your guests are sure to snapping and sharing! Serves a party of 8. Make this holiday season extra merry and bright with For Your Party’s Bright Holiday Insta Party box. Perfect for gifting to tons of people on your gift list, you’ll spread major holiday cheer by giving a Bright Holiday Insta Party box full of gorgeous party supplies! The designer-curated party in a box is full of everything you need for your holiday party, minus the friends and the booze. (You’ll have to take care of that part! #noprob). The playful tone of these designs is a fresh take on holiday party decor, making the Bright Holiday Insta Party box a total crowd pleaser! The customized stir sticks express it best with their “Merry Whatever” design. The super cute 5”x5” print is foil printed with “baby it’s cold outside!” and the custom designed cocktail napkins are perfectly punny with a “sleigh girl, sleigh” design. These are no ordinary holiday party supplies! 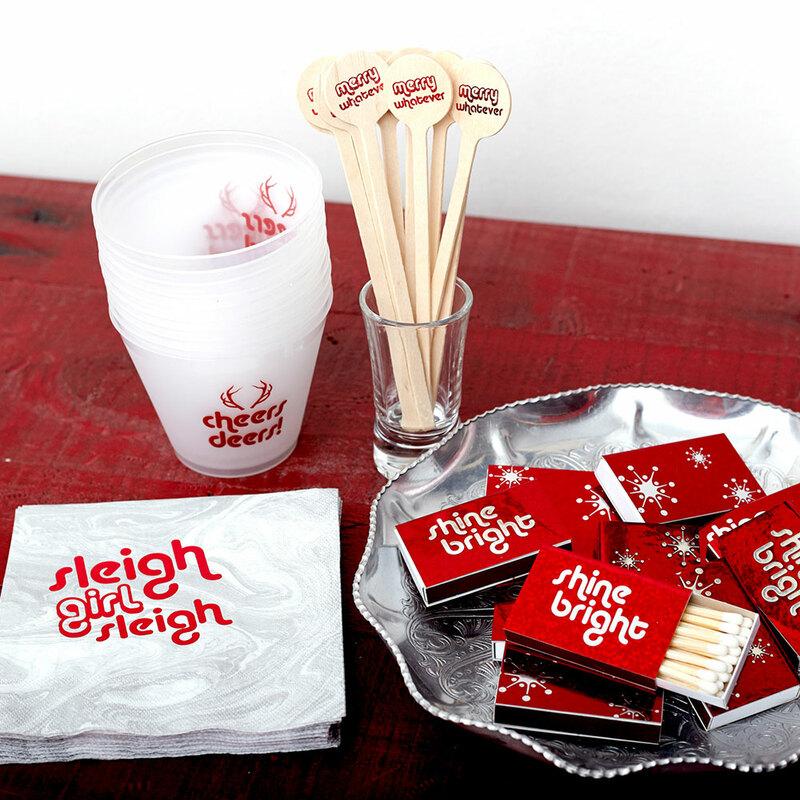 Light your holiday party candles with the adorable shiny red “shine bright” classic matches, and fill the “cheers deers” custom designed frost flex cups with your favorite cocktail. Your holiday hosting just got a major upgrade with your Bright Holiday Insta Party box. Order several extra Bright Holiday Insta Party boxes to keep on hand for spontaneous partying throughout the season. Short on time? For Your Party’s party in a box line can ship the same day! Don’t miss out on having a fabulous, social media worthy spread of party supplies this year. Order your Bright Holiday Insta Party box(es), and then sit back, put on some Christmas music and draft your guest list—the party is on the way!